Marines’ Memorial Club & Hotel in San Francisco has launched two spring getaways: the Spring Fling Package, featuring a $25 gift certificate, and the Secret Ingredient mobile promotion, offering exclusive travel rewards. Marines’ Memorial Club & Hotel, a historic hotel in San Francisco, has announced two spring deals: the Spring Fling Package and the Secret Ingredient mobile promotion. Pairing spacious accommodations with complimentary perks, these spring getaways encourage guests to explore the city during its finest season, with a variety of festivals and events near the hotel in addition to warm weather. The Spring Fling Package is offered to both guests visiting San Francisco and Marines’ Memorial Club members. Special pricing is available exclusively to Marines’ Memorial Club Members. For more information about Marines’ Memorial Club & Hotel, call (415) 673-6672. Originally created as a “living memorial” to the U.S. Marines who served in the Pacific during World War II, the Marines’ Memorial Club & Hotel has been a fixture of San Francisco’s Union Square neighborhood since 1946. The 1920’s-style Beaux-Arts hotel blends modern touches with a rich history, featuring 138 well-appointed guestrooms, a top-floor restaurant and a 646-seat historic theatre. 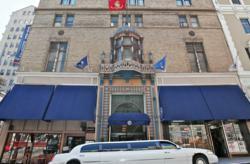 The hotel is open to club members and guests visiting San Francisco.